Oh I know how it can be, sometimes after yoga class my back is really sore! And my muscles get really sore after a workout! If I had “sore muscles” from exercise I would not be stuck in bed for weeks and in a wheelchair for months! As if I couldn’t take way more pain than them and not even show it… dumbasses. i get that all the time, when i try to explain to people that i can’t talk to them right now and they have to leave me alone because i’m having a low blood sugar episode and they go, “yeah, i get like that too when my blood sugar is low.” but calling it “insulin shock” doesn’t help, b/c they don’t really know what that means and want me to explain it on the spot, completely ignoring the fact that i just told them that i. can’t. talk. to. them. right. now. i’d like to get them all into a room one time, talking at me, while i go into convulsions. that’ll teach ‘em to shut up. Yeah I get it that often it is that people don’t want anything to be *really wrong* – they can’t handle that thought. It makes them feel too vulnerable and mortal, themselves. they want you to reassure them that it’s not really that bad. which is why people continue to ask me questions after i’ve carefully explained to them that i’m about to become irrational and they need to not talk to me for ten minutes. 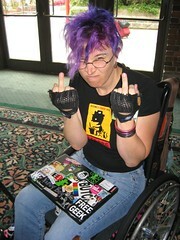 imagine how horrible it would be if somebody in a wheelchair were to express how awful it is to be stuck in a wheelchair. the earth would stop turning. thank the gods you’re so brave and cheerful, badge. Yes,it’s very irritating to listen to this when you’re upset and don’t want to talk with anyone but they just want to help after all.